An automatic employee timeclock enables you to track employee arrival and departure behavior for compensation and general management purposes. These automatic employee timeclocks can be punch-clock style like the AcroPrint ﻿automatic time clock, or digital biometric styles like the Icon Time System TotalPass. 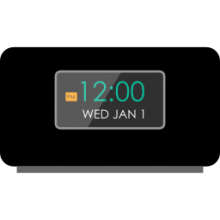 Punch clocks will print the date and time on a time sheet, with manual adjustment of the month. While a digital time clock like the Icon enable multiple punch options that include badge, biometric (fingerprint), web and pin- it can even take photos of employees of the biometric option fails for some reason. Biometric identification eliminates the problem of 'buddy-punching', when an employee's friends will punch in for them. Another handy feature is that the employee information captured by this icon and biometric time clock can be exported to the range of different software including QuickBooks Pro, SurePayRoll, Paychex Flex Payroll, and a variety of other compensation and accounting software. Granted, support is expensive for this particular time clock ($199-$299/year as of this writing) after the first 30 days. And there are some setup challenges, but it's great for a small business of under 500 employees, functioning as a standalone system or part of an interconnected network that can be managed over LAN, VPN, WAN or the Internet. 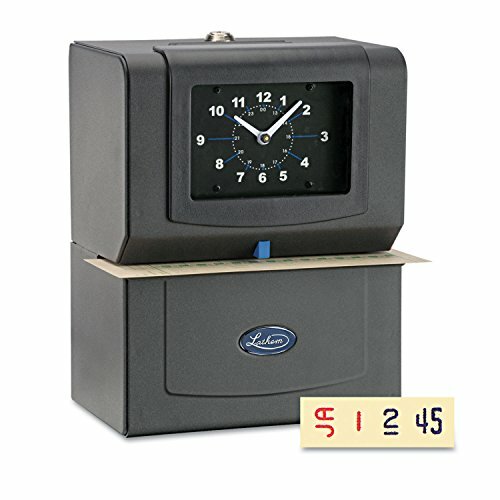 The heavy-duty, punch time clocks obviously lack the sophisticated features of a digital and biometric time clock, but they are rugged, simpler to set up and manage, and are often more appropriate for factory environments. Let's take a look at the best-selling automatic timeclocks and see how they compare. The Lathem 4001 Automatic Time Clock is a heavy duty time clock designed to operate in harsh industrial conditions. The Lathem automatic time clock features a steel case and heavy-duty synchronous motors for time accuracy. However, some users have noted that the time clock needed to be adjusted and the operations of the time clock were inconsistent. Other users like the old fashion design and sturdy construction of the Lathem time clock. All in all, the Lathem automatic time clock is most appropriate for factory and other industrial settings, but may not be as appropriate for quiet office settings. One user of the Latham 4001 time clock commented that he appreciates the old fashion design and heavy-duty materials that go into the Latham time clock. For example, the coined steel type wheels, all metal construction and Latham ribbon 7-2 CN components haven’t changed in years. On the other hand, other users have commented that this unit is loud, and may not be suitable for quiet office-type work environments. Therefore, the Latham 4001 is a good option for industrial or loud work environments. The AT-4500 calculating time clock is an excellent option for businesses with up to 50 employees that want a simple time clock that is easy to use thanks to its use of intuitive programming. The AT-4500 can be set to display in regular time or military time and is a standalone product with no connection to a computer required. Users of this clock have noted how easy it is to set up and use with minimal training required. A small number of users have commented on the fact that the timecards can be expensive to replace. In general, the Calculating AT-4500 is an excellent option for small businesses under 50 employees. According to most users of the AT-4500, this time clock is very easy to set up and can be up and running very quickly. In fact, one user commented that during the first week of operating with this clock his power loss business for two hours. However, the AT-4500 retained the cumulative hours with no error and worked without any problems. The only negative of this clock, as commented on by users, is that replacement time cards can be expensive. The Icon Time System’s TotalPass Small Business Premium Biometric Time Clock is an excellent time-keeping option for small or medium sized businesses. Users of the Totalpass time clock like the Totalpass for its versatility in providing businesses with a variety of choices for managing punch options to include biometric, pin, badge, or web. The Totalpass premium biometric time clock also gives businesses multiple ways of managing employee timecards by offering options for USB, network, or web based capabilities. Although some users have found the fingerprint reader to be unreliable, in general, users agree the Icon Totalpass biometric time clock is an excellent option for small or medium sized businesses. Most users of the Time System Totalpass time clock appreciated the flexibility of the system and the fact that it integrates easily with software such as Quickbooks, giving businesses an efficient way to track labor expenses. In addition, most owners found the Totalpass time clock easy to set up and running, allowing them to integrate the system into their business quickly. On the other hand, a small number of businesses found the fingerprint system to be difficult to set up and Quickbook integration was tricky. In general, the consensus is that the Time System Totalpass time clock is a very good option for businesses looking for a versatile time tracking system. 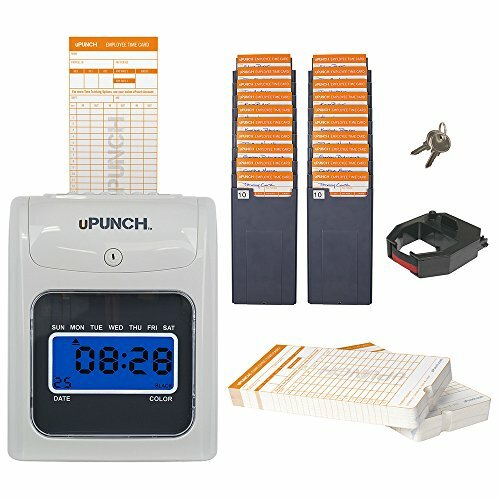 The uPunch HN3500 is a decent system for small businesses that are looking for a simple time recording system that also offers the ability to manually enter employee hours worked. Users of the HN3500 generally appreciated the simplicity of the system and the ease of setup, allowing it to be integrated into their business quickly. On the other hand, some users noted that the data collected by the time clock does not automatically transfer to their computer software, therefore, requiring more time for that data to be recorded. Still, the HN3500 receives good marks for its simplicity and ease of operation. Most users of the HN3500 Time Clock Bundle liked the customer service and minimal amount of time required to integrate the system into their business. In fact, one owner pointed out that even though the unit stopped working after six months, he was able to quickly get it back online thanks to the customer service support he received. Conversely, another user commented that he has experienced problems with the timeclock jamming and employees becoming frustrated with it. All considered, he HN3500 is a system that delivers good value for small businesses. 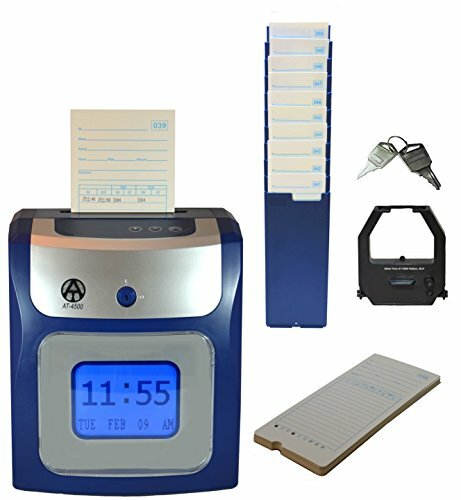 The Acroprint 150RR4 is a versatile and durable time recorder system for businesses of all sizes. The 150RR4 time recorder allows for a variety of configurations including left-hand printing, Spanish wheels, and symbols. Users praised the 150RR4 for its durability and accuracy. Some users, however, noted that the print on timecards is sometimes hard to see and the system requires some calculations to be done by hand. All in all, the Acroprint 150RR4 is a solid option for businesses of all sizes looking for a durable and accurate time recorder system. Most users of the Acroprint like the simple mechanical design of the 150RR4 and noted its durability and ease of use. The analog Clock face and automatic print recorder both received high marks even in harsh environments. On the other hand, a small number of users noted that the Acroprint does not automatically calculate the time, requiring users to do it by hand. For most users, the Acroprint remains a solid and durable option as a time recording system in industrial environments. An automatic employee time clock is a way to track the times when your employees enter and leave the work facility- measuring punctuality and work attendance is crucial for most any organization, whether they be a factory or a corporate office. Many times, the automatic employee time clock is used to understand how much to pay workers, and other times it is used to ensure that salaried, white-collar workers are actually on the job. While there have been advances in employee time clock technology over time, the most traditional style of employee time clock has been a machine that printed or stamped the day and time of employees arrival and departure on a card. 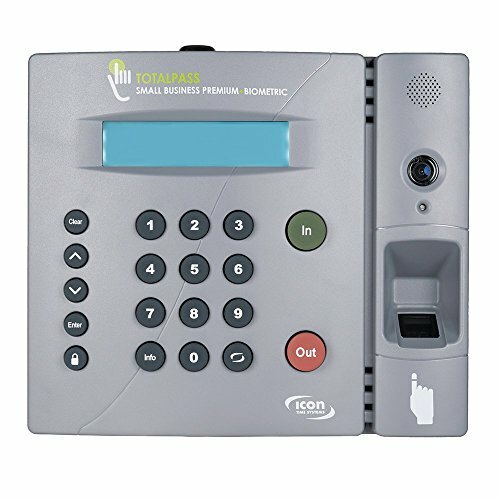 Technological advancements have made it easier to integrate human resource systems with these timeclocks- sometimes employees just use key cards that they swipe and all the information is uploaded to some sort of employee management system that stores and tracks all employee information. This sort of employee monitoring ability prevents employees from mis-entering their times on a spreadsheet, where they can enter inaccurate information about when they arrive and leave work, whether at the end of day or when they take lunch breaks. As we have seen, there is a marked difference between digital and biometric automatic employee timeclocks and print timeclocks that will merely punch the date and time on to employee time sheet. 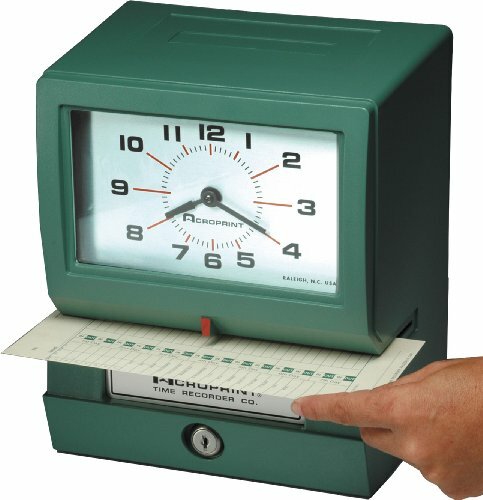 If you're looking for a really simple way to set up employee time and attendance tracking, for job costing purposes and date recording applications, you may want to just purchase a print and punch employee time clock. On the other hand, a biometric time clock is a sophisticated and technologically advanced alternative if you are looking to be able to export employee information into a payroll system, be able to manage the device wirelessly, take photographs of employees as they enter or leave the workplace, and even grab information from the timecards through a USB. If you're looking to purchase an automatic timeclock, take some time to consider the style that you are looking for and that makes the most sense for you and your organization. Read our timeclock reviews on this page, evaluate the comparison table, and check out the individual product pages to get a sense of what other users are saying about the automatic timeclocks that they have purchased for their businesses.